The 1978 book Spacecraft 2000-2100 A.D. tells the story of futuristic spacecrafts in the past tense. That is to say, the book tells the "history" of the 21st century through different types of space vehicles. The image below is of the TTA Colonial III spacecraft from page 49. The Colonial was the first of the high-capacity freighters and in its life has undergone a number of major changes. The early models bore no more than a passing resemblance to the one which is so familiar to us today. The Colonial I was first built in 2004 and was manufactured in the great TTA yards in North Africa with the specific task of transporting the massive amounts of equipment and materials required for the construction of the Lunar Research Station. There's even a Spacecraft 2100-2200 A.D. which was released in 2006. I had that book as a kid! I spent hours staring at the gorgeous paintings. I ignored the text and had my own stories for each photo. Thanks for featuring it. Brought back great memories. just another "me too" :D i also had that book! I had it, too. Great fun. Heh. I can practically hear all the NIMBYs in the shadow of that ship screaming bloody murder and threatening lawsuits. I had that book too! Amazing to see it again. That was one of my two favourite books, along with one called 'Spacewreck' (I think) which may have been by the same author - it was done in the same 'future history' style, and featured the same sort of ships, only all crashed or floating dead in the void. wow...wow...wow...I can not believe that was the vision of imagination. You can buy it on Amazon!!!!!????? There was also another cool book this size that was a story about a starship captain who landed on an outpost planet to build a railroad to the north pole. If anyone remmebers it, you'll never forget Private Paarts. I didn't own this book, but I very badly wanted to. Oh, how I wanted it. And still do. A friend of mine had that one and I remember it clearly to this day; the illustrations were exquisite. He also had "Aliens in Space", which I believe was set in the same universe, or at least recycled a lot of the same artists. I do have a copy of "Galactic Aliens" by Alan Frank, which has a similar approach and some of the same artists (including Angus McKie, Colin Hay, Tony Roberts, and Alan Daniels) but frankly most of the artwork and content is downright execrable. Nothing like the TTA series. I just discovered this blog, by the way, and seeing the cover of this book at the top of the page, my jaw nearly dented the floor. Instant syndicate. Thanks! i'm another one who had that book (now all i have is the dust jacket). thanks for letting me know that it's being revived! The vast majority of the paintings in these books appeared as the cover art for British science fiction paperbacks during the '70's. I loved Angus McKie and Peter Elson - I'll just go and waste another few hours looking at my old book collection. Looks like the illustrations are 'heavily influenced' by Chris Foss (http://www.altanen.dk/Gallery-Main.htm), as was so much 70's science fiction illustration. Fabulous book! I lost my childhood copy but found it at a used bookstore for $12. I got Spacewreck on eBay for $10! I still read it often. Fun writing and great art. It was an era of rampant sci-fi art that will unfortunatley never come again. BTW:Do not buy the new version of "Spacecraft". It features NONE of the original art, but CG renderings. I too remember these books. Even as a youngster, I suspected they were a bunch of book covers strung together by a flimsy "story". The art was awesome. 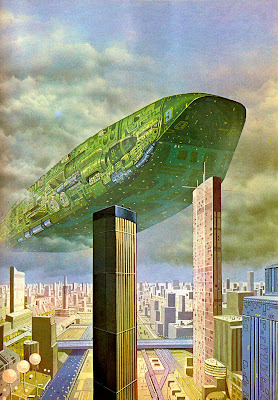 Peter Elson's were especially impressive. It WAS basically a bunch of book covers stitched together with a flimsy story, but also more than that. My dad had this book, and I adored it. Your post has made me want to go look for it in my mom's bookshelves again. Yet another "me too". I loved those books! Hi ! an italian reader here, me too enjoyed this book when i was a kid, i still have it !!! italian version of corurse !!! great book and great entertainment !!! years light ahead in 1978 !!! The books have been re-done using computer CGI graphics. Man, those aren't just CGI, those are really bad CGI. Like, 'I've never used a graphics program before' bad. The original paintings were beautiful, and they had tons of talented artists, what the hell happened? There were four books in the "Terran Trade Authority" series: Spacecraft 2000 to 2100 AD, Great Space Battles, Spacewreck: Ghostships and Derelicts of Space and my personal favorite, Starliners. The new version with the CG graphics isn't as nice as these old ones with all the hand-painted images. There was also a very similar series of books to TTA called "Galactic Encounters" that was penned by the same author (different pen name...Stephen Caldwell) that had a similar motif of a backstory told around collections of various SF art. it was so naive to believe that we'd care about the moon at all in 2004.